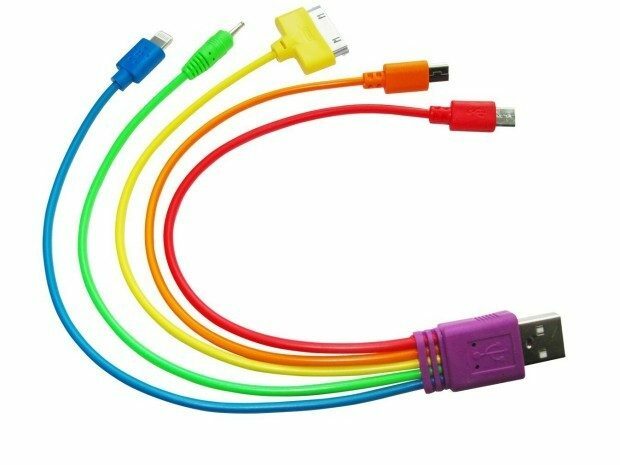 5 in 1 USB Recharge Cable, with 8 pin for apple iPhone 5,5C,5S, 6, iPad, 30 pin for iPhone 4, 4S, socket for Nokia, Micro USB for Samsung, HTC and other Android Cell phones, Mini USB Socket for Digital Camera, MP3, and any other device with the suitable socket. 4 less cables need to be taken. USB Charger powers your portable devices from your power bank, laptop, home computer, or vehicle.